What's up, guys? Oh, just reading the scariest book I've ever read. Seriously. 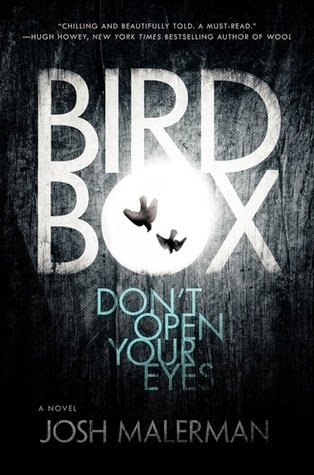 I started reading Josh Malerman's Bird Box at almost my usual bedtime and ended up staying up all night reading. It's that gripping and spooky. Summary from Goodreads.com: Most people ignored the outrageous reports on the news. But they became too frequent, they became too real. And soon, they began happening down the street. Then the Internet died. The television and radio went silent. The phones stopped ringing. And we couldn't look outside anymore. Malorie raises the children the only way she can; indoors. The house is quiet. The doors are locked, the curtains are closed, mattresses are nailed over the windows. They are out there. She might let them in. The children sleep in the bedroom across the hall. Soon she will have to wake them. Soon she will have to blindfold them. Today they must leave the house. Today they will risk everything. At one point of another, everyone is afraid of the dark. But what if the dark is of your own creation and the only way to stay safe? Living in a world of blacked out curtains and blindfolds, Malorie and her friends know that fear lurks at the edge of their vision. Malerman is amazing at putting the reader in their position. His descriptions keep the ability to visualize just out of reach, which amplifies the horror. There are multiple scenes with characters finding their way around houses, blindfolded, with their hands occasionally brushing against something terrifying that they can identify, or even worse, that they can't. Told in alternating chapters between Malorie's present escape with her children and flashbacks to her time in a safe house with other strangers, the reader is filled with sadness for what is going to happen. We know that Malorie is alone in the present, so every interaction with her friends in the safe house looms with upcoming disaster. I didn't want to get attached to these doomed characters, but I couldn't help it. They were so brave and hopeful. I anxiously watched the percentage of my Kindle, hoping this wouldn't become a series, so I was happy when Malerman wrapped Bird Box up as a stand alone novel. If this is the excellence of his debut novel, I can't wait to see what he comes up with next. I read that book around the same time you did and had almost exactly the same experience! I find myself paying very close attention to news stories these days..... Haunting!